About 10 species, 2 in tropical Africa, the others American; only the following in the United States. 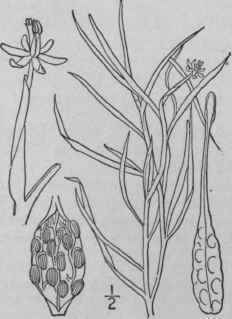 Type species: Heteranthera reniformis R. & P.
Leaves reniform, oval or ovate. One of the filaments longer than the other two; flowers few or several. Flowers white, little exserted from the sheath; leaves reniform. Flowers blue, much exserted; leaves ovate to subreniform. 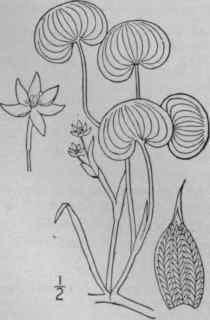 Filaments broad, equal; spathe 1-flowered; leaves ovate to oval. Heteranthera reniformis R. & P. Fl. Per. I: 43. 1798. Leptanthus reniformis Michx. Fl. Bor. Am. 1: 25. 1803. Stems creeping in the mud, rooting at the nodes. 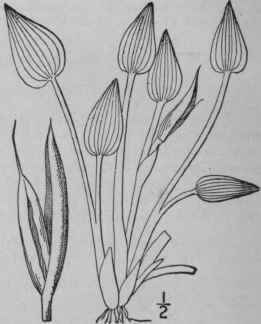 Leaves long-petioled, the blades reniform, wider than long, 8"-2o" wide, rounded at the apex; petioles sheathing, 1'-4' long; spathe few-flowered; inflorescence little exserted; tube of the perianth straight or slightly curved, slender, about 4" long, its lobes shorter; flowers white or pale blue; anthers basifixed, the 2 upper oval, the other on a longer filament and linear; fruit oblong. In mud or shallow water, Connecticut to New Jersey, Georgia, Illinois and Louisiana, and in South and Central America and the West Indies. July-Sept.
Heteranthera peduncularis Benth. PI. Hartw. 25. 1840. Stem stout, creeping on the mud or floating, rooting at the nodes, much branched, often 1° long or longer. Leaves long-petioled, the blades ovate to subreniform, 2 1/2' long or less, acute, obtuse or cuspidate at the apex, cordate at the base; spathe several-flowered, the inflorescence much exserted; flowers blue; perianth-tube nearly 5" long, straight or nearly so, the lobes much shorter than the tube; filaments slender, one of them longer than the other two; anthers basifixed, sagittate; fruit narrowly oblong, about 5" long. Ponds, Nebraska(? ), Missouri and Kansas to Mexico. July-Sept.
Pontederia limosa Sw. Prodr. 57. 1788. Heteranthera limosa Willd. Neue Schrift. Ges. Nat. Fr. Berlin 3: 439. 1801. Leptanthus ovalis Michx. Fl. Bor. Am. 1: 25. 1803. Stems commonly much branched from the base, 6'-15' long. Leaves numerous, oval or ovate, obtuse at the apex, rounded or slightly cordate at the base, 1' long or less; petioles 2'-5' long; spathes i-flowered, often on peduncles 1' long or more; flowers- white or blue, usually larger than those of the preceding species; filaments broad, equal or nearly so; anthers linear, often sagittate. In mud or shallow water, Virginia to Kentucky, Missouri, Nebraska, Florida, Louisiana and throughout tropical America. July-Sept.
Commclina dubia Jacq. Obs. Bot. 3: 9. pi. 50. 1768. Leptanthus gramineus Michx. Fl. Bor. Am. 1: 25. 1803. Heteranthera graminea Vahl. Enum. 2: 45. 1806. Schollera graminea A. Gray, Man. 511. 1848. Heteranthera dubia MacM. Met. Minn. 138. 1892. Aquatic, stem slender, forked, often rooting at the nodes, 2°-3° long. 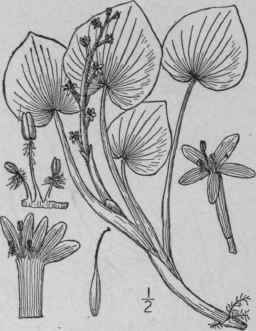 Leaves linear, flat, elongated, acut-ish, finely parallel-nerved, their sheaths thin, furnished at the top with small acute stipule-like appendages; flowers light yellow, the perianth-segments narrow; stamens nearly equal; tube of the perianth very slender, 1'-1 1/2' long; spathe 1-2-flowered; filaments dilated below; anthers linear, 2" long, sagittate; style shorter than the stamens; stigma several-lobed; capsule 1-celled with 3 parietal placentae, many-seeded. In still water, Quebec to Oregon, south to Florida and Mexico. Also in Cuba. Occasionally occurs in a small form on muddy shores. July-Oct.